UPDATE: DUE TO OTHER, LOWER COST OPTIONS AVAILABLE NOW, WE ARE NO LONGER OFFERING THESE HAND-MADE ADAPTERS. THANKS FOR YOUR PATRONAGE! * Yes, Ingineer's 120v adapter is less because he recycles the original 120v plug while doing your conversion. By all means buy his, but if you want another, or want different lengths, we offer it too. ** A screwdriver is required to open the plug and rotate two pins to work with NEMA 6-30. *** Please allow extra time for this adapter as special parts are mail-ordered and will take time to arrive to us before we can start building. Additionally, if our supplier changes the price of this part, we may need to pass the additional cost on to you. The current price listed reflects our cost at the time someone last ordered one. If the price has changed, we will confirm with you first. 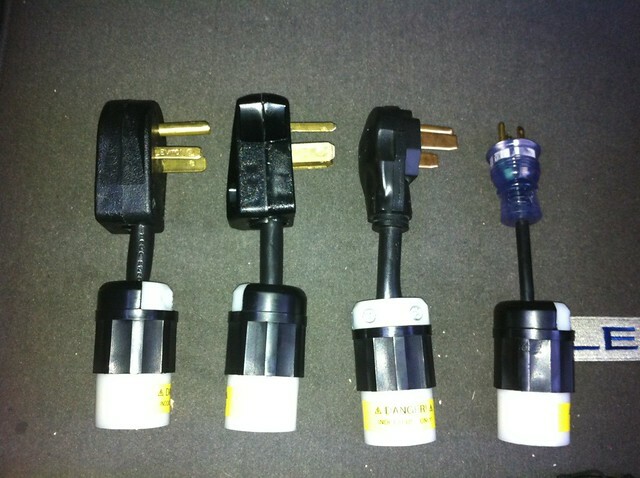 If you need a quick reference of what most of these plugs look like, see this post. I'm personally fond of the stubby variety as they take up less room in the trunk! PLEASE NOTE: These adapters are made-to-order using parts purchased from local hardware stores and hand-made, so their appearance may vary. Please expect orders to take at least a week for them to arrive. TO PLACE AN ORDER: Send an email to evseadapters@yahoo.com and let us know which adapters you want (e.g. A10 stubby, A14 long). Within a day or two we will send you an email with specific payment instructions. Work will begin once payment is received (or, in the case of a check, once the check has cleared). PAYMENT METHODS: We are offering these as a courtesy to the forums and have not started a full time business for it. Because of this, our preferred payment method is PayPal using the Send Money > Personal > Payment Owed option because it's quick and inexpensive. If your PayPal account is linked to a checking account there will be no fees for this transaction - however, if it is not, PayPal will impose a small fee (~3%) on top of the cost we quote you. If you do not have a PayPal account (or just prefer not to use them) you can pay by check, although you must wait for the check to clear before we process your order. QUESTIONS & PROBLEMS: If you have any questions or experience any problems with the ordering process or your adapters, please send an email evseadapters@yahoo.com or ask here in this forum thread. If all else fails, please send me a PM and I'll see to it personally. LEGAL DISCLAIMER: These adapters are intended for use ONLY with Ingineer's EVSE mod discussed above. Because they are hand-made, they are not UL listed - but are made from UL listed parts. 240v electricity is serious business and extreme caution should be exercised while using these adapters. For safety's sake, do not use these adapters and the EVSE outdoors in inclement weather unless you know for sure you're on a GFCI protected circuit (the J plug side of the the EVSE is safe for outdoors in all weather). 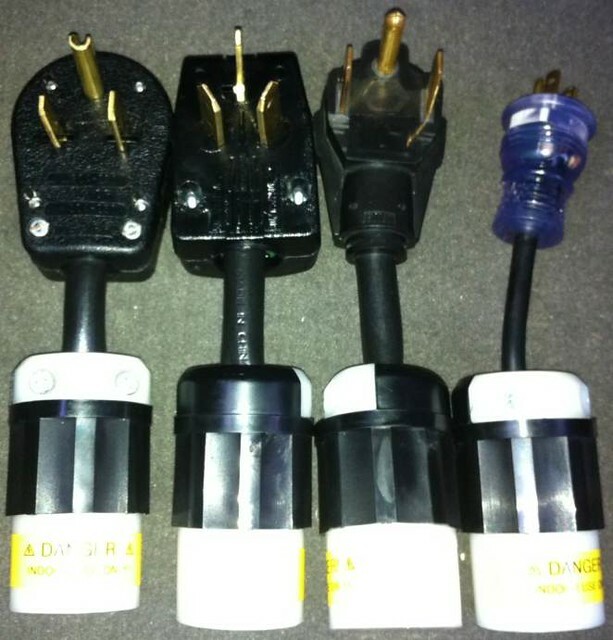 BY PLACING AN ORDER WITH US, YOU ASSUME ALL RISK ASSOCIATED WITH USING THESE ADAPTERS AND AGREE THAT WE ARE NOT LIABLE FOR ANY DAMAGE THAT MAY RESULT FROM THEIR USE. Last edited by GeekEV on Thu Jul 25, 2013 3:46 pm, edited 14 times in total. Will you be using a molded-on connector on the L6-20R end? Can you post pictures of the 6 connectors that you plan to use? Are you going to be offering the Gary to L6-20 Adapter? Is that adapter UL listed? Are both ends molded or just one? EVDRIVER wrote: Is that adapter UL listed? Are both ends molded or just one? We investigated UL approval, but they require us to submit several adapters for testing to destruction, and we didn't feel it was worth the headache. garygid wrote: Will you be using a molded-on connector on the L6-20R end? Not initially as those aren't commonly available in local hardware stores. But if things get really busy, we may order some in bulk and start using them. garygid wrote: Can you post pictures of the 6 connectors that you plan to use? Last edited by GeekEV on Sun Apr 24, 2011 9:31 pm, edited 1 time in total. All you need now is the Gary to L6-20 to make the set complete! Hey, I thought the cord went in the other end! And, that test to destruction is quite messy! Also, thanks for the pictures. It is great of you guys to do this. garygid wrote: Hey, I thought the cord went in the other end! Several people have recently asked me questions on extension cords. First off, for future questions, please ask them here in the forums instead of sending me email or a PM, that way everyone gets to benefit from the answers. You can probably extend the EVSE's 24 foot range an additional 30 feet if you use a good quality L6-20 extension cord made with a minimum of 12AWG cable. One such source for these cords is here. That is a 15 foot extension, which will give you up to almost a 40 foot reach (with the EVSE's cord) or you can get 2 and that will give you almost 55 feet. I don't recommend you exceed this distance without moving to a heavier gauge cordset, such as at least 10awg. Otherwise your charge time will increase, and you (or some poor soul) will be paying for electricity that never makes it to your car, and is instead heating up the cord. Also: if the voltage drop is too much, the Leaf will stop charging altogether!